Ever wonder what the best companies do to get ahead? What is it that allows them to outperform their competitors? How can the average company do what leaders do? According to Aberdeen Group, the difference comes down to the technology that leading companies use, and the capabilities it enables. 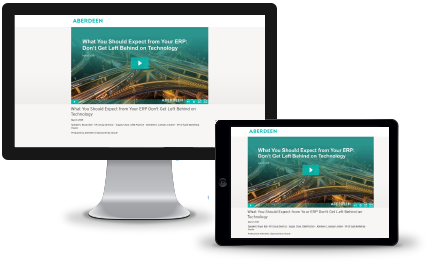 In a recent webcast, Aberdeen shared highlights from its research into the current state of enterprise resource planning (ERP) and other finance systems. Aberdeen uses its own analytical framework to evaluate results among best-in-class companies (the top performing 20 percent) and the remaining respondents. Watch the webcast to learn what best-in-class companies expect from their ERP cloud. 1. Best-in-class companies deliver better service and are more efficient. Whether a business delivers products, services, or both, customers are demanding a great experience: accurate, personalized, and on time. Best-in-class companies make complete, on-time deliveries in 98 percent of cases, compared to 88 percent among average companies. They keep to their own internal schedules 95.4% of the time, vs. 88.4% for others. And they’re 2.5 times more productive than their competitors. The only way to make this happen, Aberdeen notes, is by getting immediate information to make faster decisions across the board. Look for an ERP system that can easily share data with your CRM, supply chain, database, and other systems for consistent, timely information. Access to better information enables faster, better decision-making, which pays off in profitability: best-in-class companies have seen an improvement in profitability of 26.6% over the past two years, vs. only 10.7% growth for average performers. 2. They have stronger capabilities in financials, integration, and data management. Best-in-class organizations close their books faster: 3.3 days, on average, vs. 5.2 for all others. And they get access to key financial information when they need it 95% of the time, vs. 85% for all others. 71% of best-in-class companies said their “integrated business applications serve as a complete and auditable system of record.” This is significantly higher than the average company, only 57% of whom have this capability. According to Aberdeen, the ability to connect technology solutions across the business is perhaps the most critical differentiator. Best-in-class companies are more likely than others to have their ERP system integrated with their human resources, customer experience and supply chain applications. All of this provides the “single view” that business leaders need to make the right business decisions in a timely manner. 3. They look to the cloud to address technology gaps and connect disparate solutions. Best-in-class companies look to the cloud for help with their integration challenges. In fact, when asked why they moved to the cloud, best-in-class companies cited their main reason as a desire to standardize on a single ERP system across multiple entities. They want the single, consolidated view across the business that cloud ERP enables, so that they have the information they need to make better business decisions. When looking at your options for cloud, Aberdeen advises to look for a provider that has designed an offering from A to Z—where all the applications sit on the same platform—so that you’re not faced with fragmented data sets across multiple clouds. A cloud “hairball” will only compound the integration challenges that best-in-class companies do their best to avoid. 4. They’re more likely to adopt software as a service. Often, when the average company thinks about the cloud, they think about data centers and platform providers. Some are taking their legacy ERP applications and hosting them with a third party, so that they no longer need to buy new hardware, maintain data centers, or upgrade servers. The problem with this approach is that the company is still responsible for maintaining and upgrading its legacy ERP application, along with any customizations made to it. Upgrades are lengthy and expensive. Instead, the best companies turn to software as a service (SaaS) for ERP, as well as other applications —which makes them more up to date than their competitors. In the SaaS model, the provider rolls out new functionality on a regular cadence, giving the subscriber access to the latest innovations, capabilities, and best practices as part of the monthly fee. Among best-in-class companies, 36% update their systems automatically as new releases become available, vs. only 25% of average performers. And compared to upgrading an on-premises ERP system, SaaS updates are virtually painless. For most of these companies, cloud ERP is the last upgrade they will ever need. 5. They’re building the business of tomorrow, today. Best-in-class organizations are always looking toward the future. They’re continually looking at new ways to streamline for efficiency, modernize technology and services, improve interoperability, and grow customers. To accomplish this, they’re ready to make use of the latest innovations as they’re rolled out, whether that means voice interaction with your ERP software; autonomous, self-driving systems; blockchain-based ledgers; or some other innovation that no one has thought of yet. Different cloud providers have different approaches to innovation. Many vendors claim to offer emerging technologies such as machine learning, artificial intelligence, the Internet of Things and more; but they only provide a platform for development. It’s up to the customer to decide on a business case, build the functionality and put it to use in a business setting. Not only does this add complexity, it delays the time between a company’s investment in the technology and its adoption. Delays are not a way to remain an agile, best-in-class organization. An alternative approach (one that Oracle favors) is embedding these innovations into SaaS applications for specific use cases, so that the customer can uptake the capabilities immediately. For example, a subscriber to Oracle EPM Cloud can take advantage of intelligent process automation to automate account reconciliations or speed up the financial close. Such an approach means the customer can spend less time focusing on the technology, and more time using it to become a leading company. New technology isn’t just on the horizon; it’s here, now. Leading organizations are already taking advantage of it to build the business of the future. To compete with them, you need to stay current on technology, be ready for growth, and make your organization future-ready. Watch the webcast to get all the key findings, and learn how to become a best-in-class company with tomorrow’s ERP, today.